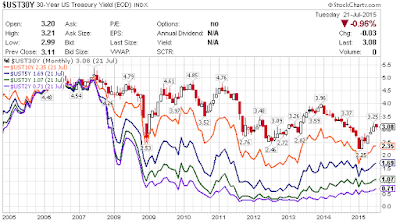 Mish's Global Economic Trend Analysis: Watching Yields Rise: Are Treasuries a Buy? Watching Yields Rise: Are Treasuries a Buy? From mid-2012 until the beginning of 2014, US treasuries were in a steep decline (yield rising) in expectations of Fed rate hikes that never came. 2014 was a great year for treasury bulls, undoing the carnage of the previous year and then some. 30-year treasuries hit a record low yield. So far, 2015 has been a bad year for the bulls. Charts courtesy of Curve Watchers Anonymous. Yields generally bottomed in February, then rose to early-June highs, with the long end sporting a steeper slope as is typical. Setting aside the often-heard "certificates of confiscation" phrase, treasuries are a reasonable buy if one believes yields are going to stay steady or decline. They are to be avoided if the expectation is for yields to rise. Part of the question is whether or not the Fed hikes, and by how much. But it's more complicated than the typical "yes-no when" analysis that we see in the media. 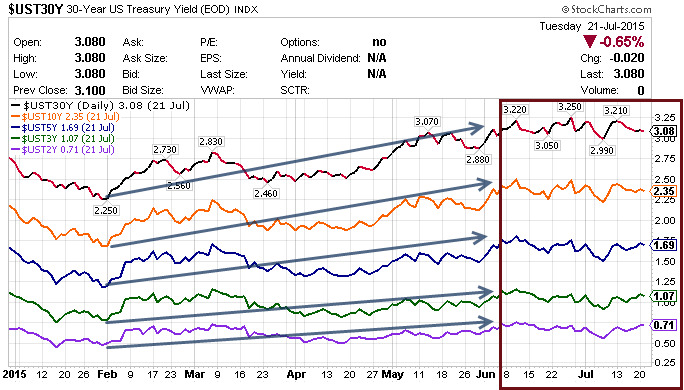 It's very conceivable for short-term rates to rise but long-term yields to decline if the market becomes convinced that Fed hikes will slow the economy. There's even a recent hint of that possibility looking at the action in treasuries since mid-July (the yield on 5-year treasuries has risen faster than yield on 10- and 30-year treasuries. I am still not convinced the Fed is going to hike this year. Much will depend on retail sales, housing, and jobs. A good retail sales report will send yields soaring, likely across the board. Finally, even if economic data is weak, there is a chance yields rise if inflation picks up. Thus, one needs to keep inflation in mind, especially over longer time-frames. That said, the recent decline in crude, commodities in general, does not lend much credence to the notion the CPI is going to take big leaps forward any time soon. 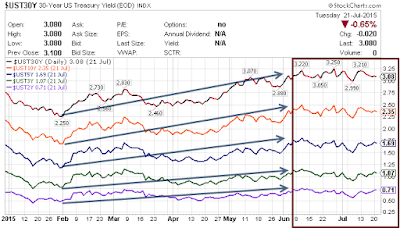 one believes as I do, that economic data is unlikely to send the Fed on a huge hiking spree, and that if and when the Fed does react, yields on the long-end of the curve may not rise as everyone seems to expect. Risks are strong economic data, inflation, and a bond-yield hike-tantrum even if economic data is weak. Fed hikes, in and of themselves, are not the critical factor.